Although outer foot pain may occur in runners, running itself is not the cause of the discomfort. According to the Sports Injury Clinic website, numerous factors may contribute to outer foot pain in runners, including running shoes, overtraining, an insufficient warm-up and poor nutrition. Outer foot pain, while potentially painful and debilitating, typically responds well to conservative therapies, such as proper shoe selection, certain physical therapy modalities and taping procedures, along with rest and thermal therapies. 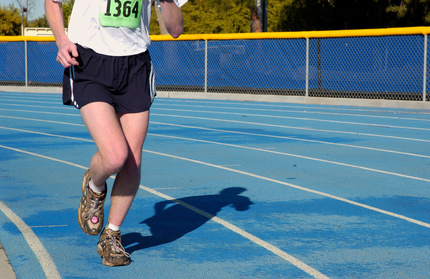 Stress fractures on the outer portion of the foot may be caused by a running-related injury. According to the Sports Injury Clinic website, foot stress fractures can manifest after prolonged and repetitive leg movement, and long distance runners, wearing conventional running shoes, are particularly susceptible to this type of injury. Common symptoms associated with foot stress fractures include pain, tenderness and swelling in the involved bone during physical activity. The Sports Injury Clinic website notes that stress fractures in runners typically occur in the lower leg and foot, including the outer portion of the foot. A stress fracture of the fifth metatarsal bone--a short, thin bone that links the fifth toe to the cuboid bone--can cause pain on the outer side of the foot. X-rays of the injured area typically do not reveal evidence of a fracture until the fracture begins to heal two to three weeks later. Suspected stress fractures should be treated with six to eight weeks of rest, and sometimes crutches can be helpful. Blisters can cause pain on the outer portion of the foot, especially the heel. The Mayo Clinic website suggests that inappropriate footwear can contribute to blister formation and that shoes should be selected that are wide enough to accommodate the foot without chaffing. Runners often experience blisters, which are caused by friction from shoes or socks that rub against the skin. The outer layer of skin peels away from the inner layers, and the potential space between the layers fills with lymph fluid. While blisters on the outside portion of the heel are common in runners wearing new shoes or those participating in long-distance events, such as the marathon, blisters can be prevented by ensuring that footwear is flat, wide and flexible, keeping the feet as dry as possible and by using a second skin dressing to tape the involved area at the first sign of problems. Peroneal tendinitis is a cause of outer foot pain in runners. According to the Foot Health Facts website, peroneal tendinitis is an inflammation in one or both peroneal tendons. The two peroneal tendons run side by side behind the foot's lateral malleolus, or the bony bump on the outside aspect of the ankle. The principle functions of the peroneal tendons are to stabilize the foot and ankle and guard against ankle sprains or ligament damage. Inflammation of these tendons occurs after excessive and repetitive use, and common symptoms associated with this condition include pain, swelling and warmth in the involved area. Rice University states that runners often experience peroneal tendinitis from overtraining and that peroneal tendinitis causes pain on the outside part of the ankle or pain along the outside edge of the foot, up to the base of the fifth metatarsal bone.